One of the highest manufacturing industry is garments manufacturing industry where different types of garments are manufactured. Calculate Garments cost of making time to time is the right decision because the main motive of garments manufacturer is to make a profit where they manufacture garments and then sell it. But the problem is, what should be the required price of that item and how to calculate the garments cost of making. To solve this problem first, you have to know the cost of garments making then add your markup price to set the selling price. Here cost of making means the cost of manufacturing garments. Monitoring garments making cost is necessary so that trends of the cost of making can be identified and you can actually know whether your garments making cost is increasing or decreasing. Based on your change in garments cost of making you may take decision accordingly. Fixed Cost are those cost of garments manufacturing which are fixed in nature. With the increase of a number of unit of production, your per unit fixed cost will be reduced. Some example of fixed cost is; salaries and wages, interest expense of bank loan, a rental expense of your factory building, depreciation expense of your fixed assets etc. Variable cost is the cost which is change over an additional number of unit of production. But per unit variable cost is fixed. The variable expense of garments making is; Utility (Electricity cost, Water cost, steam cost, Air cost) Expenditures, transportation cost, repair, and maintenance expense etc. Here the most crucial variable cost is utility cost. We need to carefully handle utility section to minimize utility cost. To identify hourly total production capacity, you need to identify the total number of machine and capacity of each machine. After that, you need to multiply the hourly capacity with machine number. For calculating daily production of your garments, you need to multiply your hourly effective production capacity into working hours each day. To calculate monthly production capacity you have to multiply your daily production capacity with the number of working days in a month. Electricity: To get electricity cost you need to identify the total kW consumption of your factory and then multiply total KW with Price of per Kw electricity. Remember the cost of electricity is much higher in case of fuel generator and local REB compared with Gas Generator. Water: Water cost is the cost of collecting water and the filtering cost. Normally in textile and garments, De-Mineralized (DM) water is used. Steam: First identify total consumption of steam per machine each hour and then multiply with the number of machines. Compressed Air: In case of air you have to identify the compressed air cost for per cubic meter then multiplies with the total consumption. Monthly Garments Cost of Making (GCM) = (Monthly Total Cost of Garments Operation)/Monthly Total Output Produced by the Factory. Monthly total Production is the output produced by the factory. Utility Expense is Tk 100,000, where Electricity Cost is Tk 500,000, Steam Tk. 200,000, Water Cost is Tk. 100,000, Chiller Cost Tk. 100,000, Compressed Air Cost is Tk. 100,000. The number of working days in a month is 26 Days. 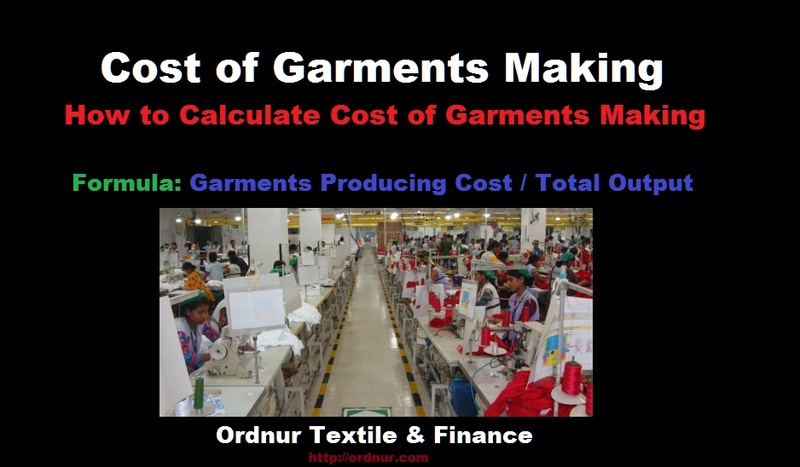 After reading this hopefully you understand how to calculate garments cost of making. If you have any confusion then please let me know, I will try to clarify further. Note: All these costing information is arbitrarily taken, so these values are not actual costing value. Tagged Cacluate the CM (Cost of Making) of a Garment, Calculate CM cost of Garments, Calculate Garments CM (Cost of Making), Calculate Garments Cost of Making, Calculate the CM of a Garment, Calculating Garments CM, Calculating Garments CM Making, Calculating Garments Making, CM Cost Garments, Cost of CM, Cost of Garments Making Per Piece of Garments, Cost of Making of Garments, Costing of Utility of Garments, Daily Production Capacity of Garments, Find Out Garments CM Cost, Fixed Cost of Garments Making, Garments CM, Garments CM Cost, Garments CM Costing, Garments Cost of Making, Garments Making Cost, Hourly Total Production Capacity of Garments Machinery, How Garments CM, How to Calculate (CM) Cost of Making, How to Calculate Garments CM Cost, How to Calculate Garments Cost of Making, How to Calculate the CM (Cost of Making) of a garment, Monthly Production Capacity of Garments, Pre Requirement of Calculation of Garments Cost of Making, The formula of Calculating Garments Cost of Making, Variable Cost of Garments Making.